EVERY family has a black sheep. You know, like that odd brother who knows every zip code, or the cousin who collects spatulas from every state. They may not be entirely bad, you might even be envious of their skill or, shall we say, devotion to a particular subject. The Arbor Lodge is in that camp. There are some oddities with this chap, but they certainly aren't to his disadvantage. In fact, it's what makes him unique and lovable. We'd say take him home, but he just might BE your new home. Your first concern might be the lack of a front door. Do not fear. We may be slightly eccentric, but we don't forget any of the details. In a stunning flash of brilliance we attempted some pluralism. True, that is a driveway going into a garage. And true, the front door does open into that driveway. But did you notice that the driveway is covered over by a trellis? The driveway and the front porch are one and the same. Our preference is for grass and pavers or some other type of differentiation under the trellis. This should make it feel more like a front porch that has a garage, rather than a driveway with a front door. Once you've found the front door you can enjoy the large parlor with the cozy inglenook. Down the hall a powder room and closet appeal to your sense of hospitality. At the back of the house are the kitchen and formal dining. You could leave the dining open, or enclose it with some columns and half walls. We think a faux dropped beam ceiling would add a touch of class and nostalgia. Off the back of the house is a grilling patio with a smaller trellis over it. Upstairs are three bedrooms and two baths, including the master suite. 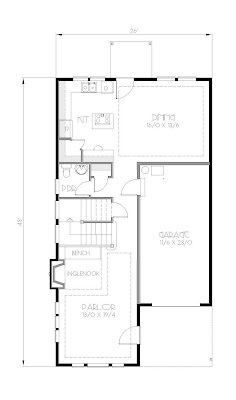 The loft area has been designed such that the addition of one wall would turn it into a bedroom. Like your uncle who speaks in computerese would say, "It's got an expansion slot!". Well sure, sort of. The fireplace downstairs has a false framed chimney which allows for some play upstairs. In the bathroom we chose to install a small vanity for toiletries, a makeup counter, or your soap-on-a-rope collection. A window brings natural light to the room. 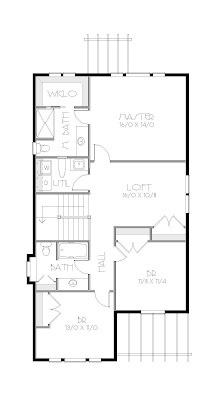 The small laundry room is convenient to the bedrooms and even has enough space for an optional foldaway ironing board.